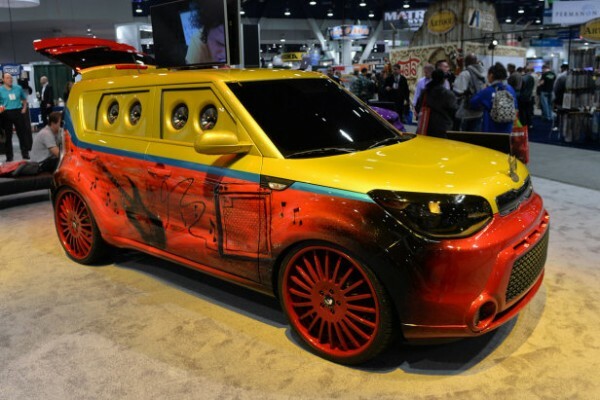 Music Themed Kia Souls – Sema Auto Show – The Bunch Blog! SEMA has been pretty mellow this year in terms of over-the-top mod jobs. Sure, there have been some questionable choices, but none have been quite as questionable as the vehicle you see above. This is one of five versions of the redesigned Kia Soul that have been rolled out for the show, all of which take their inspiration from music. The Vans Warped Tour Soul is the airbrushed vehicle you can see above. Its questionable paint job is accentuated by eight eight-inch Infinity speakers in the side windows, a slide-out barbecue and a 50-inch flat panel monitor on the roof. We imagine this is what happens when you let Xzibit near your Kia Soul. The Vans Warped Tour car also features LED ambient lighting, and the wheels are moderately sized for a SEMA vehice – just 20-inches. The Amped Soul isn’t a car, so much as a car-shaped enclosure for several very big speakers. The passenger-side B-pillar has been removed, and the rear door has been replaced with a suicide door, allowing the driver to put the massive stereo on display. LED lighting and four twelve-inch Infinity subwoofers have been fitted, as well as a JBL Pro Live “club-sized stereo.” Those gold wheels are 22-inch Forgiato, three-piece items. The purple Kia was designed by the team at Rides magazine, and has been dubbed the DJ Booth Soul. There’s no roof for this hamster shuttle, as it’s been removed, allowing a DJ to rise up on a stage situated where the backseats would be. Three-spoke, 19-inch wheels from Rotiform actually look nice, partially due to the lowered ride provided by the Ark Performance springs. A speaker enclosure sits in the grille, while LED and strobe lighting turn wherever the DJ Booth Soul is into a party. The fourth Soul on display is the Music Memorabilia car, a mobile museum with musical artifacts from the likes of Slash, 50 Cent, Jimi Hendrix and John Legend. Each item is on display in a custom trunk enclosure. The platinum paint and gold wheels are inspired by platinum and gold records, while the interior sports gold diamond sticking and a mix of suede and leather. Finally, The Voice Soul is inspired by NBC’s talent reality show of the same name. Wearing not-so-subtle red paint and a The Voice logo on the side, its design is perhaps the simplest of the five cars. Twenty-inch wheels add a bit more visual flair, but this Soul is all about its interior. The coaches’ chairs from the show replace the standard seats, while red leather, black suede and red stitching dominate. The newest iPad Mini is hooked up to a 40-inch TV, a microphone and the car’s Rockford Fosgate speakers, turning the whole thing into a mobile karaoke bar.